If you’re like many Texans, the first warm, sunny weekend gets you motivated to spruce up your home. Developing simple, smart spring cleaning and home improvement habits can make a big difference for the environment and your pocketbook. Start by using less toxic cleaning products and only buying what you need. Clean with reusable rags instead of paper towels. When done, take leftover or unused cleaners or other household products that contain potentially hazardous ingredients to a local community household hazardous waste (HHW) collection center. Find HHW collection centers or events in your area. Donate any unwanted clothing, shoes, bedding, and furniture. Donated items don’t have to be pristine. Most charitable organizations have textile-specific recyclers who accept their merchandise in bulk and ship to other reuse-markets or recycle the material. If you have used computers or TVs, donate or recycle them. Texas law requires television and computer-equipment manufacturers to offer recycling opportunities to consumers for these electronics. To learn more, visit TexasRecyclesComputers.org or TexasRecyclesTVs.org. When you’re scrubbing away in the kitchen and bathroom sink, check for leaks. A faucet leaking at a rate of one drop per second can waste up to 3,000 gallons of water per year. That’s the amount of water needed to take more than 180 showers! Fixing hot-water leaks can save up to $35 per year in utility bills. As you’re washing and putting away your winter wardrobe, wash only full loads and use cold water. Washing full loads, as opposed to partial loads of laundry, can save an average household more than 3,400 gallons of water each year. Using cold water instead of hot or warm can save more than $30 annually. Hang a clothesline in your backyard and air-dry your clothes. Clothes dryers account for six percent of residential electricity consumption. Want to save more? This is also the perfect time to install that ceiling fan. Ceiling fans allow you to raise your thermostat setting about four degrees without discomfort. Energy Star certified ceiling fan/light combination units are 60 percent more efficient than conventional fan/light units, which can save you more than $15 per year on utility bills. For many more tips to keep our air and water clean, conserve water and energy, reduce waste, and save money, visit TakeCareOfTexas.org. 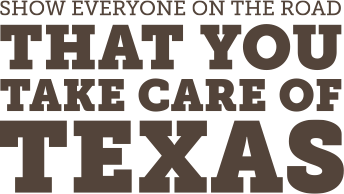 While you’re there, pledge to Take Care of Texas, and we’ll say thanks by mailing you a free Texas State Park Guide.